Everett De Roche’s career as a screenwriter was more than Ozploitation, but given he was a key figure in Australia’s defining cinematic movement, we’re going to focus on this phase to demonstrate why he inspired a fanbase all of his own. The first title that should be invoked when talking about not just De Roche’s career but Ozploitation as a whole is Patrick, the supernatural thriller about a nurse tasked with caring for a comatosed young man who may or may not be killing people with his mind. De Roche’s first collaboration with director Richard Franklin – one that would last 25 years – was the kind of scrappy, energetic blast needed in a film movement’s nascent stages. Patrick is a hell of a lot of fun, and one you’ll enjoy watching with some friends. After you’ve watched that, your evening continues with Road Games, the Rear Window-meets-Duel outback thriller featuring the distinctly American pairing of Stacy Keach and Jamie Lee Curtis. Also directed by Franklin, this film is a propulsive blast, with some all-time classic moments of suspense and craft. 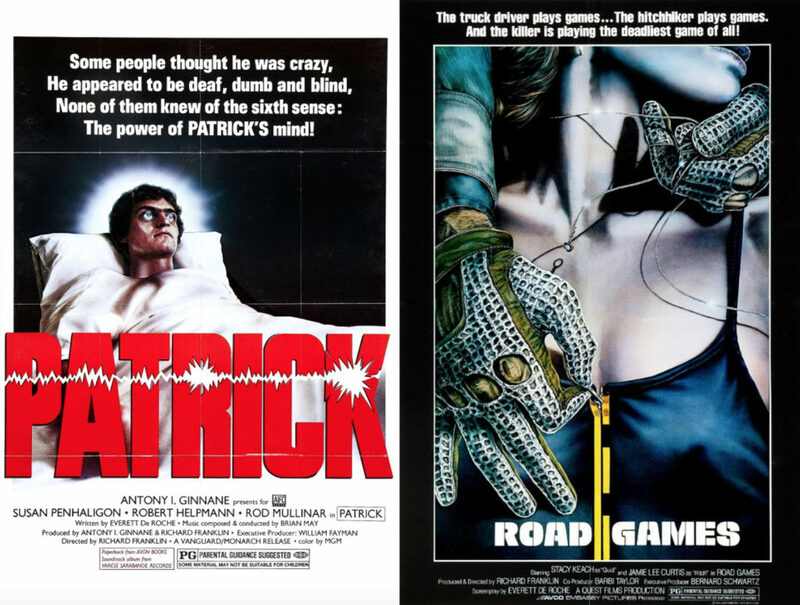 Substitutions: If you can’t get or have already seen Patrick, check out Long Weekend (1978). Released the same year as Patrick, De Roche’s film about a married couple heading to the beach for a weekend getaway positions them as the antagonist and nature itself as the protagonist, with what appears to be an unintended environmental message the result of a perfectly simple horror idea. If you can’t get or have already seen Road Games, track down Razorback (1984), and we’ll only bother with three words to sell you on this one: Gigantic. Killer. Pig. The Hidden Gem: Want to see something off the beaten path, a title rarely mentioned during discussions of De Roche’s work? You need to get your hands on Link (1986). Elisabeth Shue plays an exchange student at an English university who becomes a live-in assistant for a professor who is preoccupied with the training of super-intelligent chimpanzees… and then the killing begins. If, somehow, that’s not enough to convince you, then we should point out that the professor is played by Terence Stamp. The next episode of Hell Is For Hyphenates, featuring C Robert Cargill talking Everett de Roche, will be released on 30 June 2017. This entry was posted in blogs and tagged c. robert cargill, cheat sheet, everett de roche, link, long weekend, patrick, razorback, road games on June 23, 2017 by The Hyphenates.